Intimate gatherings require intimate decor, beautiful table settings, and touches of color and decoration. 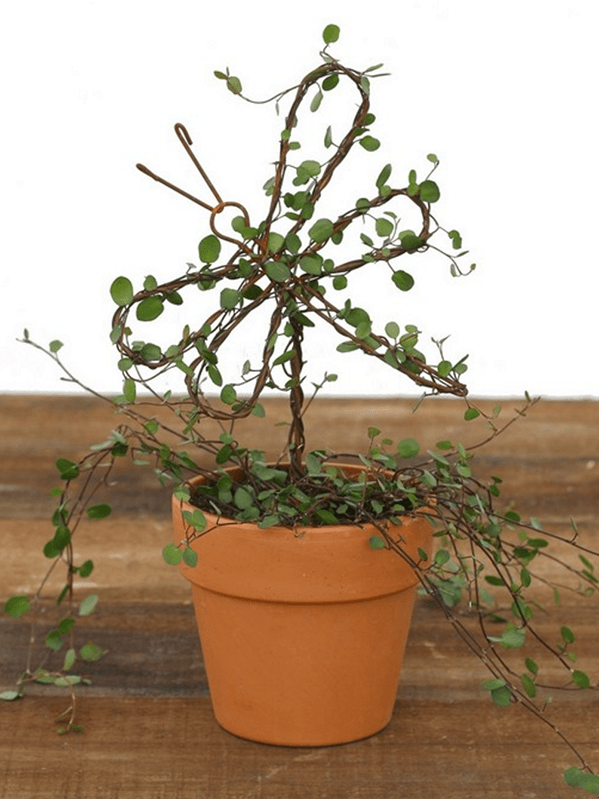 Adding a Heart Angel Vine Topiary to the table scheme of your next dinner party or gathering will bring a sense of closeness and love to the party in the form of a living Fresh Topiary. This delicate climbing Live Ivy Topiary is the perfect answer to the need for a large visual impact in a small space. This selection of Live Topiary Plants will breathe a whisper of color to the setting with the shades of pink color from the silk flowers and wide wire ribbon. This beautifully set up form of a heart is elevated to a height of 12" from the bottom of the pot, with a single stem in the center, giving the illusion of a floating heart of Live Ivy Topiary. The budding Live Ivy Topiary spill over the sides of the pot in a symphony of flowing vines and greenery. This delicate looking Live Ivy Topiary is a highly suggestible plant that prefers to live in very bright, but not direct, sunlight and sunny locations. Too much sun will cause the Live Ivy Topiary to develop a "sunburn" and die. It is important to keep the soil of the Live Ivy Topiary Plants moist but not overly wet. Checking the soil condition regularly is the best defense to damaging the Live Ivy Topiary. For the health and beauty of this Live Ivy Topiary, it is necessary to prune the dead and unruly vines from the Live Ivy Topiary and coax the newly growing vines to follow the heart form of the topiary. Adding to the beauty of this Live Ivy Topiary are the extra touches of color that come from the beautiful silk roses and artfully tied triple loop bow adorning the bottom of the elevated heart. The wire rimmed pink ribbon is created from a very light silk weave which allows for a slight amount of transparency to allow for a touch of the stem greenery to show through. When purchasing this Live Ivy Topiary, there is the option of buying a 4.25" Terracotta pot to replace the standard white plastic planting vessel. For added visual design, Mylar wrapping can be put around the base of the Live Ivy Topiary. This is an especially easy way to jazz up the plain pot when giving this Live Ivy Topiary to someone as a gift. Having a stunning Live Ivy Topiary that takes the unique shape of a floating heart is an unexpected and beautiful way to add a touch of class and charm to any setting. The delicate flower adornments on this winding collection of Fresh Topiary vines enhance the beauty of the natural elements of the Live Topiary Plants. HEART Angel Vine Topiary. Keep soil evenly moist, but not wet, check daily. Prune regularly to retain shape. Exposure: Bright, indirect light, Indoor Temp: 40 - 80 degrees F, Weight: 1 lb, Pot Size: 4.25 inches, Height:12 inches.